Louise Belcher’s ability to not only turn the most menial tasks into an adventure, but also to create ten times more work for herself to get out of something just to prove a point is admirable. On this week’s Bob’s Burgers, she does both with aplomb when the kids are asked to create handmade birthday gifts for their grandparents. What would have taken maybe an hour, tops, turns into a week-long mission to uncover the super-secret ceramics room that was sealed shut in the 80s. Along the way the kids stay very true to their set personalities: Louise schemes, Tina timidly protests, and Gene is along for the ride with some particularly exceptional color commentary. Through it all, however, we learn something new about Mr. Frond. Between this episode and last week’s “Y Tu Ga-Ga Tambien” it’s becoming increasingly obvious how backwards the guidance counselor’s views of the children and his role at Wagstaff are. When we first met Mr. Frond, he just seemed like a clueless grown-up. Slowly he’s revealing that while, yeah, he’s still pretty clueless, he’s also manipulative. For more than 20 years he’s kept his tampering in the seventh-grade election for class secretary boarded up behind those walls, thinking the children he serves would look down on him if they knew. Seeing that side of Frond gave Louise a better look at her own manipulative behavior. 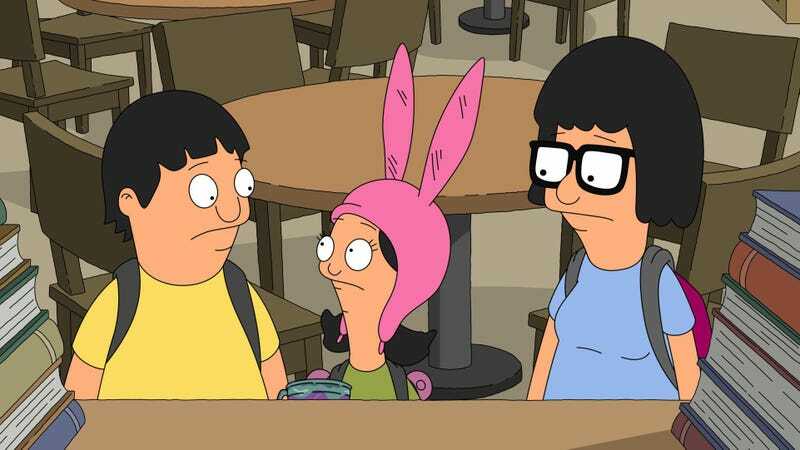 Bob’s Burgers isn’t afraid to give its main characters flaws—in many ways they’re made up of almost all flaws—but what makes them so watchable is that at the end of the day, they do what’s right. After seeing Frond’s unwillingness to own up to his mistake and treat his students with respect, Louise realizes that maybe making something with her grandparents with her own two hands instead of pawning off a decades-old mug as her own wouldn’t be so bad. And that realization gives the ever-satisfying moment of Tina being right all along. Though barely on screen, Zeke proves to be one of the best side characters on the show once again this week. His asides and Mr. Ambrose encouraging the kids to investigate the mysterious legend and destroy school property were some of this episode’s most delightful moments. Meanwhile back at the restaurant Teddy is once again inconveniencing Bob by setting up his new cell-phone repair business right at the counter. The visual of Teddy in his magnifying work glasses was fantastic, but his demeanor almost crossed the line from playfully funny into very annoying territory. Here’s hoping we get a break from Teddy next week so his comedic and emotional value can be truly appreciated. The amount of wonderful one-liners this season is remarkable, and so hard to keep track of. Leave your favorites in the comments. Another new episode next week! Bob’s hasn’t had three new episodes in a row all season. "The Secret Ceramics Room of Secrets"